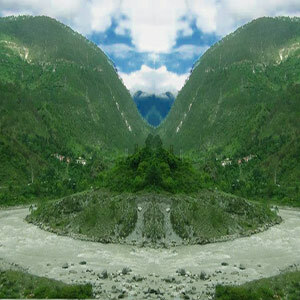 We invite you to explore India - the Land with infinite beauty ! Whether you soar high into Himalayas or peer under the ruins of the Ancient monuments dotting the landscape of India, you will cherish the experience long after your visit ! This India Travel Guide on Mirik is free from any commercial interest! This site is dedicated to promote India - the vast subcontinent, its glorious past, magnificent landscape and its infinite variety. Nestled amidst greenery, Mirik is a beautiful hill station surrounded by terraced tea estates and sweet smelling spice plantations. The unspoilt beauty of the hill station attracts many visitors to this serene hill station, just 50 km away from Siliguri. Mirik is about 50 km from Darjeeling. Mirik is derived from Mir-Yok, which is a Lepcha word for 'a place burnt by fire'. However the scenario here speaks otherwise. The long rolling lush green pastures, hills and lakes are a sight to behold. Sumendu Lake: It is an enormous manmade lake located at an altitude of 1767m, surrounded by a forested ridge. With a road of about 1.25 km spanning around it, the lake offers a spectacular view of the Kanchenjunga. The clusters of oaks, chestnuts and maples are picturesque. This lake is popular for shikara boating however swimming is not permitted. Pony rides are available. The area around the lake boasts of the best tea estates as well as orange orchards and cardamom plantations. Temples: The temples of Shiva, Hanuman and Kali Mata are famous. The west bank of the lake houses the Singla Devi Mandir or the Devi Sthan. Homedara Shiva Mandir is another famous temple. Bokar Gampa: This is another major attraction in the Krishnanagar area. Bokar Gampa is home to Mahayana monks. The Bokar Ngedon Chokhor Ling Monastery is home to nearly 500 monks practicing the Buddhist teachings. It has a monastic college Shedra. Also located here is the Kyabje Bokar Rinpoche, a retreat center for Buddhist monks. Mirik can also be explored by a day trip from Darjeeling. You can trek down to the River Balasun and climb uphill to Kurseong. Enroute you can see Dudhia, a popular picnic spot. You can take a long walk to Jhorpukhri and Pashupatinagar - the Nepal Border. Picturesque points that offer a panoramic view of the hills are Deosi Dara and Kawlay Dara. Catch the spectacular sunrise at Rameetay Dara. There is a small lake at Rai Dhap. The nearest airport is at Bagdogra, around 55km away. If you are traveling to Mirik by train, alight at New Jalpaiguri which is 38 kms from Mirik. Local transportation is abundant however the best way to explore this tranquil hill town is on a horseback or by walk. Tea and oranges are a compulsory take-back for every visitor. Antiques, souvenirs and lots more are on the shopping list and can be fun to pick. Food at Mirik is a local affair; restaurants are mostly located in Krishnanagar area of Mirik. Mirik enjoys pleasantly cool climate throughout the year, except winters which are quite severe. Accommodation at Mirik includes youth hostels, hotels for a heterogeneous budget line, Swiss cottages also popular as motels are the various options available.